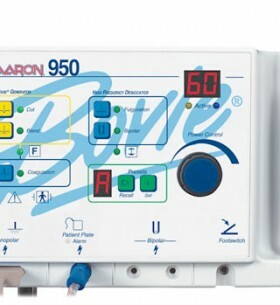 Introducing the Aaron 950, the first and only High Frequency Desiccator with Cut. You might call it a split personality. One half of the unit is a high frequency desiccator, out of the mold of our very popular Aaron 900. The other half is a Bovie Generator, giving you 60 watts of cutting power and coag capabilities – plenty of power for LLETZ/LEEP or most any cutting procedure performed in the doctor’s office. The three button pencil is a masterpiece of engineering. It allows you to adjust the power output up and down as well as to activate the unit, even when you are in foot control mode! 6 Presets – For The Doctor’s Favorite Settings.